SOPO Editor’s Note: Noah Andrew Trudeau found and transcribed several letters for the 15th New York Engineers page at the excellent New York Division of Military and Naval Affairs web site. I did further research and found this letter from the 50th New York Engineers in the same newspaper at the also excellent Old Fulton NY Postcards site. I transcribed this and other letters in the collection myself. Since “army correspondence” forms so great a part of the literature of the day, and thinking you might not be unwilling to receive a few notes from “in front of Petersburg,” a place destined to be conspicuous in American history, I take the liberty to send them. I am not able to give you any news of interest, unless a description of our situation here in winter quarters, and the every day occurrences in army life may be interesting; for there has been no movements of this army since the late advance t Hatcher’s Run, the particulars of which you have fully learned from the newspapers before this. Our lines now extend to Hatcher’s Run, and the position is well fortified, so that there is no probability that the enemy will attempt to dislodge us. I have seen it stated in some of the newspapers that our late operations1 gave us a position nearer the South side [rail]road than the one we formerly held. This is not the case, as a knowledge of our lines and a glance at the map will show. The South side road lies about three miles in a northwesterly direction from an angle where our main front line running westwardly, turns to the south; our advance resulted in the extension of this southerly line three or four miles, in a southwesterly direction, to Hatcher’s Run. But, notwithstanding we did not advance directly on the South side road, it is considered an important advantage, for it gives us the crossing of the Run, which will be of great importance in any future attempt to advance in that direction; and it also effectually protects our rear without the necessity of maintaining a rear line, while at the same time it compels the enemy to extend his line three or four miles. It should not be inferred that, because we are not engaged in any offensive operations, the Army of the Potomac is not doing an important part of the work. We are compelling Gen. Lee to keep his veteran army here for the defence of the vital part of the Confederacy; and while he sees his dominions “subjugated,” State after State, by the victorious army of the gallant Sherman, he is powerless to render any assistance, for the iron grasp of Grant is upon him. To pretend that they are only leading Sherman on for the purpose of securing his ultimate destruction, is mere talk; for we know too well, by the determination with which he disputed our march from the Rapidan to the James, that such a course does not accord with the strategy of Gen. Lee. What a splendid series of victories we have had of late! During one week, we had occasion almost daily to rejoice at the successes of our comrades in other parts of this one great battle-field; and the “shotted salutes” fired by the order of Gen. Grant, told the astonished people of the Southern Confederacy that we joined in their rejoicings over those “blessings in disguise.” How does this news of our progress seem to affect the rebel-sympathizing portion of your population? Deserters from the enemy are very numerous, and in many instances they bring with them their arms and equipments, cavalrymen their horses, etc. The effect of such numerous desertions must be a very rapid depletion of their armies, and they will be compelled, as a last resort, to arm their slaves, if they have not already commenced it. What now becomes of the argument, at one time so common, that colored men will not make soldiers! Let us then have courage, and if each one does his duty we need not fear the result. We, of the Engineers, have been encamped during the winter a short distance west of Warren Station on Gen. Grant’s Military Railroad.2 There are now ten companies in the detachment, and ours is said to be the pleasantest camp in the Army of the Potomac. Very much labor has been expended in fitting up neat and comfortable quarters, and in many instances very good taste has been displayed in the design and ornamentation of the buildings; and some of them would pass for very fair models of rustic architecture. 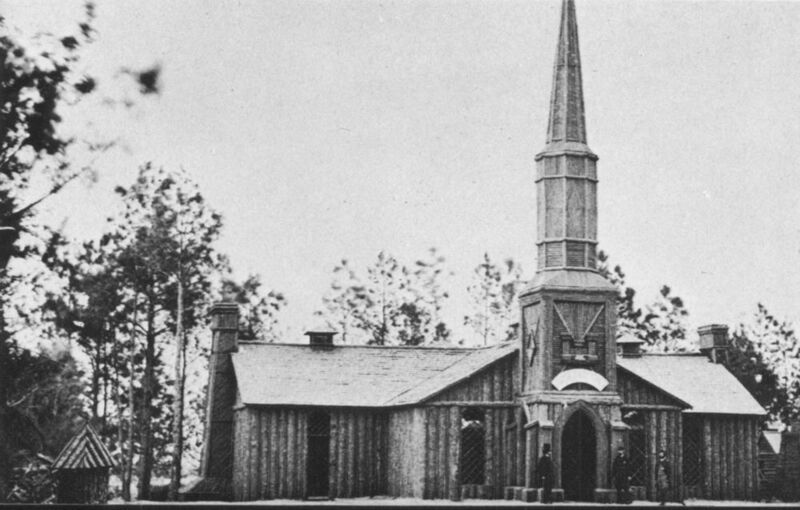 The chief object of attraction is the chapel; this is a building large enough to accommodate about six hundred persons; it is built entirely of logs, has a floor, two fire-places, doors and windows, and a steeple about fifty feet in height. The roof is covered with shingles which were made by the soldiers, and all the material of which it is built was taken in the rough when the work was commenced.3 You will see by this how we are employed while in winter quarters. Such work is much more agreeable to the men than constant drilling and it answers the same purpose in preserving their health, and in maintaining discipline. But you are not to suppose from this that we have done nothing else. The continuous line of fortifications and numerous large forts that are kept in repair, and the miles of corduroy road that cross this swampy region in every directions, furnish abundant evidence that the Engineers have not been idle. There is hardly a day passes that some companies of the detachment are not out to work on the roads or fortifications. During the past week our Company have built a permanent bridge over Hatcher’s Run, and some of the men had to work in water up to their waists; as you will imagine, it was not a very desirable job at this time of the year, even in Virginia; but it was done with [illegible] and the roads have been very muddy. But with the aid of the railroad which now extends to Hatcher’s Run, and the system of corduroy roads that are kept in good repair, very little difficulty is experienced in supplying the army. 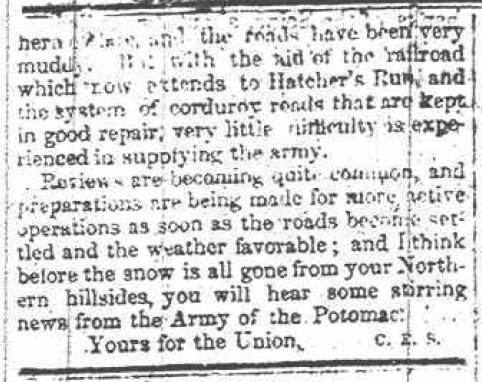 Reviews are becoming quite common, and preparations are being made for more active operations as soon as the roads become settled and the weather favorable; and I think before the snow is all gone from your Northern hillsides, you will hear some stirring news from the Army of the Potomac.